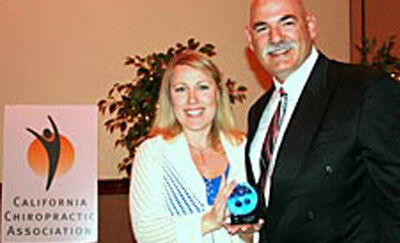 Sacramento — Dr. Michael Budincich, a doctor of chiropractic located in Pasadena, was honored for his outstanding community achievements by the California Chiropractic Association (CCA) at its 2010 Annual Convention & Exposition held June 11-13, 2010. Dr. Budincich was awarded the CCA Distinguished Service award which is presented to the CCA member who has performed outstanding service to the community. Dr. Budincich was recognized by CCA for flying teams of doctors and nurses along with medicine and supplies on his own time and at his own expense to earthquake-devastated Haiti January 23 through February 7, 2010. He made four round trips in his single engine Cessna T210 from Ft. Lauderdale, Florida, to Port au Prince, Haiti, and other smaller air strips in Jacmel and Les Cayes. Wearing his chiropractic and United Nations ID, Dr. Budincich took x-rays, treated injuries and assisted with disaster relief in any way he could be helpful, including flying food and supplies into cut-off areas onto small airstrips. In accepting the CCA Distinguished Service award, Dr. Budincich said, "I know that there are many who have done much for our profession, so I am honored to be included in that select group. My career is far from over, and I plan to continue my dedication to the profession and professionalism of chiropractic, my work toward legislation favorable to chiropractic care, and my coordination of medical teams bringing chiropractic, medical, vision and dental care to the indigent." Dr. Budincich also continues to sponsor American Red Cross blood drives and provide care at free clinics in Mexico. Further, through his newly formed non-profit "Manos Con Alas" meaning "Hands with Wings," he takes chiropractic students - and volunteer health care providers - by private aircraft to remote areas of Mexico to provide free chiropractic treatment, dentristry, orthotics, shoes, clothing and prescription eye wear. 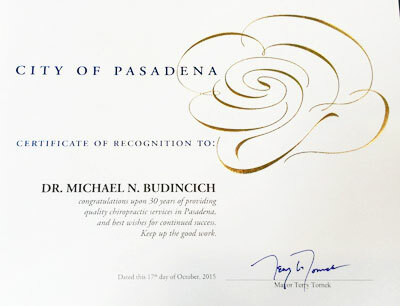 In addition to his volunteer works as a doctor of chiropractic, Dr. Budincich is also involved in his community through the Pasadena Rotary Club, Sierra Madre Rotary Club and the Pasadena Tournament of Roses Association and The Pasadena Elks Club. 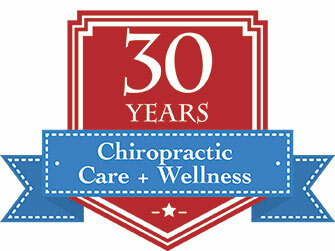 Dr. Budincich is an active CCA member and a past officer of the CCA-San Gabriel Valley District and the Los Angeles County Chiropractic Society. "Before going to Dr. Bud I was in constant pain day in and day out. I am in a wheel chair, or on a walker, it is very hard for me to walk. I have a disc in my back that needed to be removed and the pain is horrible. When it was recommended that I see Dr. Bud I really didn't want to see him because I didn't think he would be able to help me, but to my surprise the very first visit I felt better. I was truly surprised because I have been in this pain for years - every day. Short of surgery, Dr. Bud is the best thing that has happened to me for my back. When I leave his office I truly feel better, the sciatica pain is gone at least for a while."